In dog bite lawsuits questions occasionally arise about whether or not the injury sustained by the plaintiff was caused by the biting behavior of a dog. This is particularly true if the dog has never bitten a person before, had a docile temperament, and the circumstances present at the time of the incident were not conducive for dog bite injury to occur. Usually it is in the plaintiff’s best interest to allege that the injury was caused by a dog bite in those American states where strict liability exists for dog bites. In the absence of a dog bite, then recovery for the plaintiff using other legal arguments, such as negligence, may be more difficult. 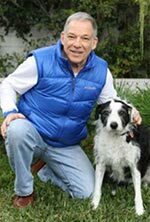 Animal behavior expert opinion can be used to reconstruct an alleged dog bite incident to determine whether the dog bit the plaintiff. 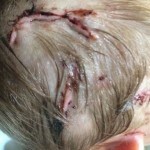 Dog bite reconstruction is based on several factors which include the position of the dog relative to the location on the plaintiffs body where the injury was inflicted, the plaintiff’s behavior at the time the incident occurred, the past behavior and temperament of the dog, and the physical features of the injury. With regard to the latter, a dog bite to a human often produces typical physical pattern of injury, which is curvilinear in nature. 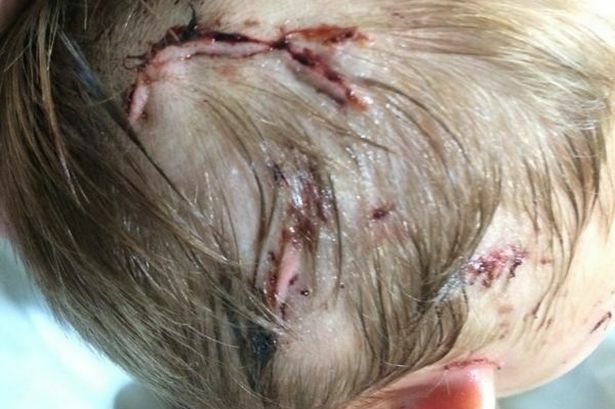 This is nicely illustrated in the photograph to the right, which shows a curvilinear laceration to the head of four-year-old boy inflicted by an Akita. Often, adjacent puncture wounds and lacerations may also be present, as shown in this photograph. Note that in those instances in which a curvilinear wound is not present, but still a dog bite is suspected to be the cause of the injury, other factors must be considered, such as those mentioned above, for accurate reconstruction in dog bite lawsuits. Additional information about the physical characteristics and reconstruction of dog bite injury can be found elsewhere on this website.